In the dying minutes of England’s 5-1 victory over Montenegro last night, there was an incident that can only be described as handbags, in all honesty! 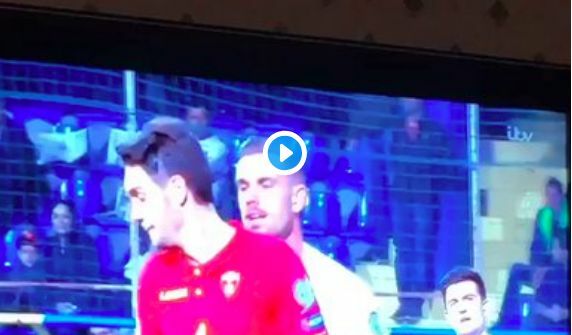 The Montenegrins, embarrassed by the battering they’d just received on their home patch, started getting in the face of England’s players – one of which was Jordan Henderson – who’d came on for a successful cameo with 26 minutes to go. Vukcevic started giving it to Liverpool’s skipper, who luckily kept his calm. ‘What you gonna do? !’ he kept asking the no.3, as you can see with some pretty basic lipreading skills! Hendo enhanced his reputation while on international duty, but he now has the far more important job of captaining us during our Premier League and Champions League run-in. It’s Spurs on Sunday, before fixtures with Southampton, Porto, Chelsea and Porto again. If we’re not on the ball, out season could be over by the midway point in April!